Photograph of Bhutanese coolies at a camp at Lingzi in Bhutan, taken by John Claude White in 1905. This is one of a set of photographs documenting John Claude White's mission to Bhutan to invest the Penlop (Governor) of Tongsa (Trongsa) in central Bhutan, Ugyen Wangchuk, with the order of Knight Commander of the Indian Empire. 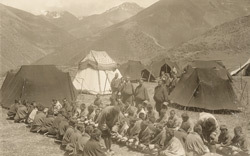 This group portrait shows the Bhutanese seated on the ground as food is distributed, with tents in the background and the hills beyond. Sir Ugyen Wangchuk stands at the right of the group in the background. This photograph is also reproduced in The National Geographic Magazine (Apr 1914), with the following caption: 'Feeding followers after arrival in camp: black yaks' hair tents and embroidered tent belonging to the head man'.